The Massachusetts Chiefs of Police Association (MCOPA) is excited to announce a new program to create identification cards for Massachusetts police officers, both active and retired. The Massachusetts Police Identification Card is a secure, standardized credential that will assure you, the public, and other public safety/law enforcement officers that the bearer is a legitimate sworn officer in the Commonwealth of Massachusetts. Thanks to the efforts of the Massachusetts Chiefs of Police Association and the Massachusetts Major City Chiefs, police officers now carry identification cards that are secure and standardized. This new program, believed to be the first of its kind in the nation, assures the public and public safety/law enforcement officers that the bearer of one of these police ID cards is a legitimate police officer in the Commonwealth of Massachusetts. This web site was created with the assistance of Boston Web Designers, so that Massachusetts residents can become familiar with the identification carried by law enforcement officers. The new ID cards use many of the same security features the Registry of Motor Vehicles deploys on your own drivers' license, which will make phony cards easy to spot. Take a few minutes to explore our web site. Then pass it along to someone you know. Our mission is to keep you safe. A service of the Massachusetts Chiefs of Police Association and the Massachusetts Major City Chiefs. Test how well you can spot a fake ID, while learning more about the features of the official Massachusetts Police Identification Card. 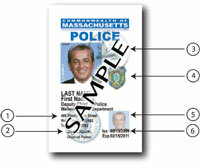 The official Massachusetts Police Identification Card has many security features that are used to determine its authenticity. Learn more about these security features here.